Jane Goninon and her husband moved to the Grampians from Melbourne for a better lifestyle. 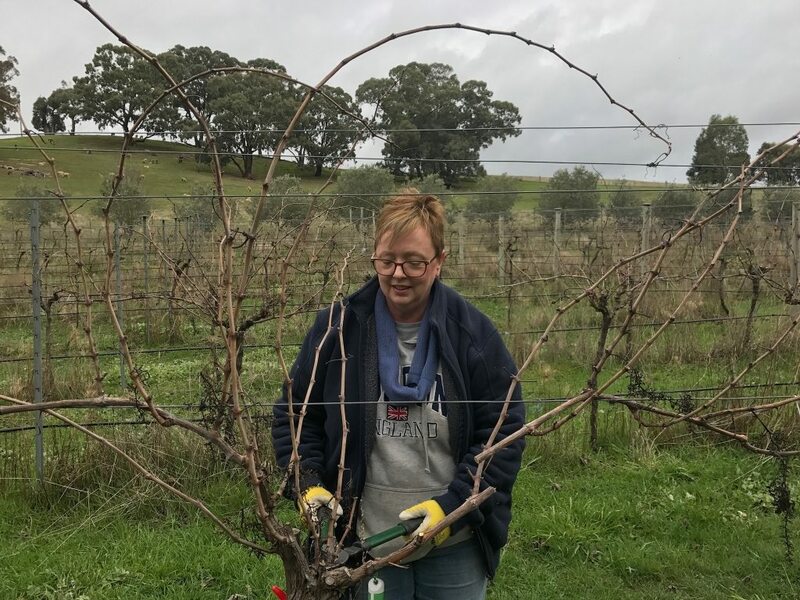 With a wine marketing degree from Roseworthy already under her belt, she says it felt natural to finally move into wine. In less than three years Jane has built a viable and enjoyable wine brand, from her boutique planting of 2.5 hectares of vines. Here’s her fabulous story. I studied wine marketing at Roseworthy, University of Adelaide when we spent seven years living in Adelaide some 20 years ago. My husband and I then went on to return to Melbourne and live and work in other industries until 2014 when we purchased a 35ha property with 2.5ha (10 acres) of vines with its own processing facility in Warrak, at the south east end of the Grampians wine region on the border with the Pyrenees. Prior to purchasing Mountainside Wines (formerly Mt Cole Wineworks) we lived in Melbourne where my husband regularly worked up to 80 hours/week. We decided that a tree change was required to ensure healthy futures. My husband continues to work off the property while we establish the brand. Prior to purchasing Mountainside Wines, I worked supporting and managing volunteers primarily in not-for-profit residential aged care facilities where I developed volunteer programs, implemented them and ensured the needs of residents, volunteers and the organisation were met. As well as managing the business I hold the roles of Secretary for the Grampians Winemakers Association and our local Hall, the Warrak Hall and am a volunteer for Grampians Community Health as a Social Support and Recovery officer, manning evacuation centres following natural disasters. You are the Owner of Mountainside Wines. Can you tell us the story of why, when and how this happened? My husband and I were living and working in Melbourne with an adult daughter. My husband was working up to 80 hours/week. We decided this was not healthy and wanted to make a change that would give us a better lifestyle. We decided on a tree change operating our own business somewhere in regional Victoria and about two hours from Melbourne. We spent about two years looking at businesses primarily in the Yarra Valley and the Mornington Peninsula. Coming to look at a property in Western Victoria or buying a vineyard and winery was not something we had planned on. However, when we arrived to view the property we were both stunned by its beauty and sense of peace and started to seriously think about what buying this sort of property would mean. My formal studies include studying wine marketing at Roseworthy campus of the University of Adelaide so the idea of a winery was not such a stretch. Nearly three years later we are operating the business with the help of a consultant viticulturist and consultant winemaker. What is the philosophy behind Mountainside Wines? With only 2.5ha of vines our philosophy is to showcase premium wines that are hand-tended and hand-picked allowing us to focus on quality and consistency of flavour. All our wines are made using grapes from a single vineyard and showcase the best of our terroir. Here at Mountainside Wines we have warm days, cool nights, and a long growing season. Added to this are the unique soil conditions of granite loam over red clay allowing the flavours of Shiraz to shine in the wine. This means wines produced in our little corner of the Grampians are rich and full of flavour and aroma and represent a unique picture of the area. Minimal intervention during the growing and processing enables the unique properties of our vineyard to shine in the wine. What grape varieties do you make wine from at Mountainside Wines? And where are they sourced from? The property itself has been growing grapes and making wine since 1998 with just under seven acres of Shiraz vines, two and a half acres of Viognier vines, and one acre of Nebbiolo vines. My personal favourite is currently our 2016 Nebbiolo which displays fresh cherry and raspberry aromas and flavours and can be drunk on its own or with food. It is light in style, very fresh and really showcases our vineyard at its best. I usually like to work in the vineyard in the morning and early afternoon and spend the rest of the day catching up on paperwork or marketing. No two days are the same but I revel in working outdoors in the fresh air and sunshine (even when it’s cold). Without mobile phone reception on the property it is peaceful and there is a lot of fulfilment in knowing the work I am doing helps produce beautiful wine. My favourite food pairing would be Riesling and seafood. As an owner/operator of a vineyard and winery I like to ensure I taste other wines when eating out to keep my palate fresh and open to different tastes. I think trying different wines with different foods is important to identify tastes and food pairings you enjoy. If I have I have ploughed on through and worked toward my goals. Try everything. Be open to new tastes, even within varieties and regions. Taste new wines, be open to new tastes, talk to the winemaker or owner/operator and most of all enjoy the experience.